Dominyun sired Domino CD, fifth fastest qualifier for the $459,700 Sam Houston Futurity(G2). HOUSTON, TX—APRIL 14, 2019—Domino CD, a son of multiple stakes sire DOMINYUN qualified for the $459,700 Sam Houston Futurity(G2) Saturday night at Sam Houston Race Park. Racing for owner-breeder and trainer Jorge Haddad, the sorrel gelding competed the 300 yards in :16.784 seconds to post the 5th fastest time from 136 2-year-olds who participated in 15 trial races. An $11,200 TQHA Yearling Sale repurchase, the sorrel gelding is out of the Corona Cartel mare Cindys First CD. GBH Streakinforgirls,a gelded son of multiple stakes sire IVORY JAMES, posted the 17th fastest time on Saturday night to earn an invitation to the $45,970 Sam Houston Juvenile Invitational. Leon Bard conditions the Texas homebred for owner-breeder Gary W. Hartsack. 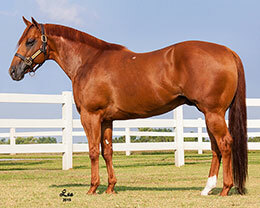 The brown gelding is out of Streakin For Toni by Streakin La Jolla. For a list of second 10 fastest qualifiers in the Sam Houston Futurity trials horses CLICK HERE. Finals for both the Sam Houston Futurity(G2) and the Sam Houston Juvenile will be run back on Friday, May 3.